The Fibox range of standard enclosures provides the designer with over 800 choices for packaging electrical and electronics equipment operating in hostile environments. 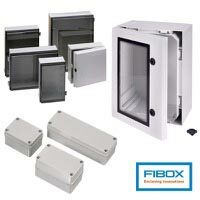 Fibox enclosures comply with EN 60529 (IEC 529) and UL 50 and UL 508. Our enclosures have achieved ingress ratings of IP 67 and NEMA 4X and 6, 6P. Enclosure performance is verified by independent laboratory testing and on-going monitoring of production. With over 700 standard accessories, Fibox enclosures are easy to use and flexible. Standard solutions exist for panel mounting, hinging inner doors, wire and management and air ventilation. 3S Outdoor use to provide a degree of protection against windblown dust, rain and sleet; external mechanisms remain operable while ice laden. Indoor or outdoor use to provide a degree of protection against the entry of water during temporary submersion at a limited depth; undamaged by the formation of ice on the enclosure. 6P Indoor and outdoor use to provide a degree of protection against the entry of water during prolonged submersion at a limited depth. Indoor use to provide by oil immersion a degree of protection of the enclosed equipment against the corrosive effects of corrosive liquids and gases.